Well this is awkward. In the Season Five finale, Amy is dead, The Doctor is in an inescapable prison, Rory is an Auton, River is in an exploding TARDIS, and all of this may not matter because every single star and planet in the universe is collapsing. What did you think of this finale? How did you like that stand-off? Can anybody else really dance like The Doctor? Did you recognize that scene from earlier in the season? Are fezes cool? This episode is available on Amazon Prime, Netflix Instant and on DVD/Blu-Ray. A really good followup to a really good episode. I absolutely love how the Doctor is making everything happen, jumping around to different points in time. Getting Rory, Amelia, River. Saving the day. Rory the Roman. The Last Centurion. So awesome with his little hand gun. Rimshot. The chase is by far the best part of this episode. I mean, a single Dalek chasing four people around a museum is amazing. And all the while trying to stop the universe from dying. A really fantastic scene. And yes, Fezzes are incredibly cool. Rory Williams AKA The Last Centurion has given me very high expectations about men. I pretty much expect any boyfriend I have to wait for 2,000 years while I'm dead and trapped inside a box. I mean, seriously. Is that too much to ask for? I don't think so. I just want a Rory Williams. ANYWAYS. The Big Bang. Big Bang 2. Such a great ending to an incredibly fun season. One of my favorite parts of this episodes and one of my favorite DW moments period is when River Song makes the Dalek beg for mercy. I mean, that's just badass. That's how awesome River Song is. I mean, maybe we should just start sending River to take care of all our Dalek-related emergencies. I don't think she would suffer from much of a conundrum of "Do I destroy and entire species?" She'll just kill 'em. But meanwhile, the Doctor is trying to reboot the whole universe, Daleks included. That's pretty badass too. And then Amy decides to also be awesome and bring him back. With his help of course. It's just a fun episode of timey-wimey-badassery-awesomeness. Oh, I also love the music when the Doctor rides the Pandorica into the heart of the explosion. Sometimes I drive around in my car blasting that song. It makes my trips to work just a little bit more epic. I honestly have to say, this IS my favorite opening to a Doctor Who episode ever. I just loved seeing little Amy walking about, going through the museum, totally passing a historic broken down Dalek in the museum, opening the Pandorica and seeing her older self there. It was the biggest head scratcher to me and I was on the edge of my seat for the rest of the episode trying to figure out how they were all going to get out of this mess. And I was not disappointed. 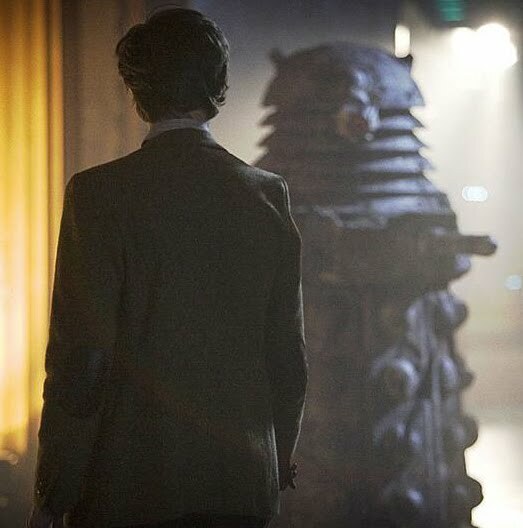 When they all do eventually gather at the museum, I love them running from the Dalek. The best part is when the Dalek thinks that River will show mercy because she is human, her response is, “Check your records.” Then you actually hear fear in the Dalek’s robotic voice begging for mercy. Another great moment is the Doctor going back and forth between time and space and all that fun stuff. It was a fun pick me up in the beginning of t episode after all the sadness we the audience were overwhelmed with the ending of the Pandorica Opens. What a great episode to end the eleventh’s Doctor first season. This episode also showed me that some people can actually pull off wearing a fezz. so this was also a good episode. i love the Daleks, so when it started coming back i was like 'YAY!' again people get mostly dead and the universe's greatest prison fixes them up (including the universe and all of space and time and yeah).